Happy Valentines Day to everyone out there ...... a special card .... and Pauls taking me to the movies. I have been stitching my protection cloth .... some nights only a few stitches....but it is coming along. Slow and steady wins the race..... I'm not sure whether I will do any stitching on the dots/in the dots. I think I will leave them as they were when I bought the piece of cloth. It has been lovely to hear that others are doing some red stitching too. I chose this beautiful print I bought from Magaly Ohika (one of her beautiful postcard sets) for the front of my latest molesking journal (#5). 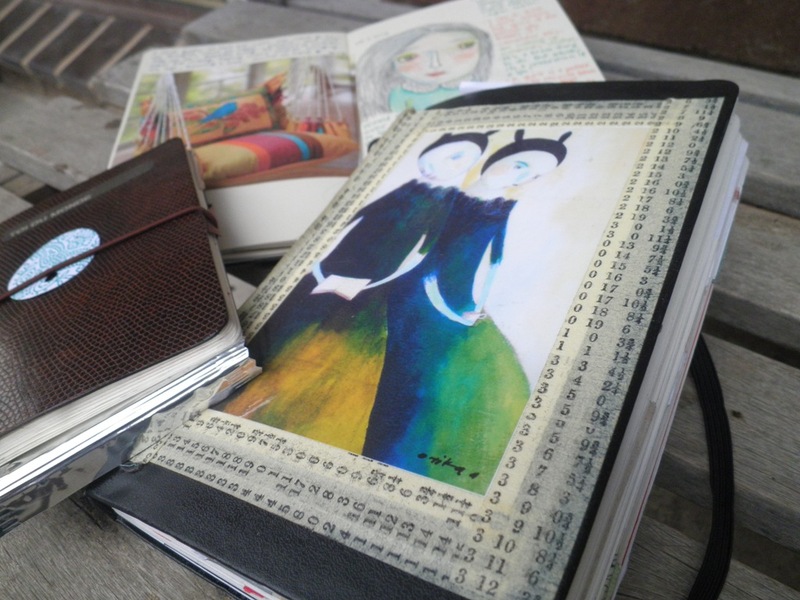 Love this series of her work ....and I love her art on the front of my daily journals. Very inspirational. Some new art supplies... some Daniel Smith watercolors. I do LOVE his colours!!!! 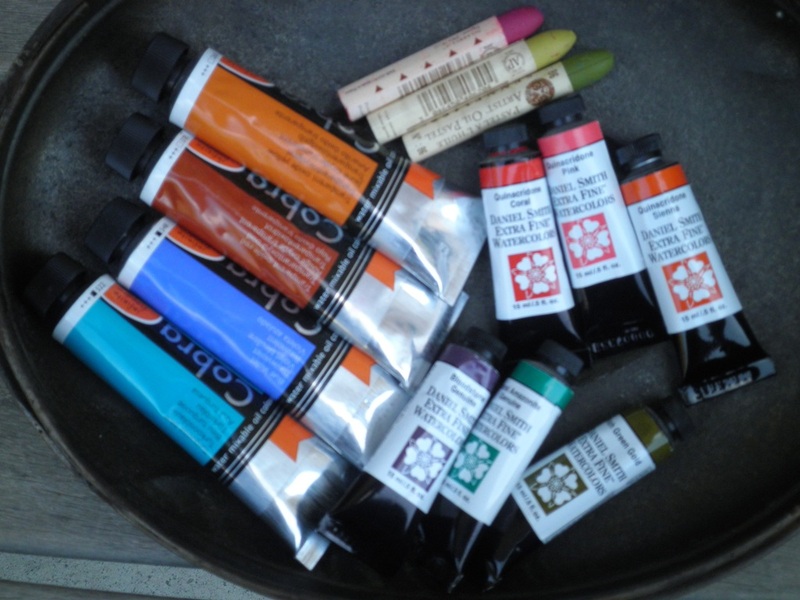 Some new cobra water based oil paints and a couple of new sennellier oil pastels. Fun, fun, fun. And lastly a photo of my sweet old dog Oakey (16) having a little snooze with his teddy. 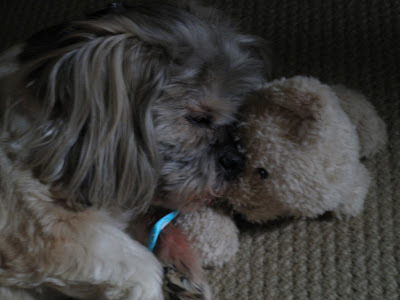 He loves to rest his head on a pillow or his toys. He's the sweetest little man.....and sleeps a lot these days. 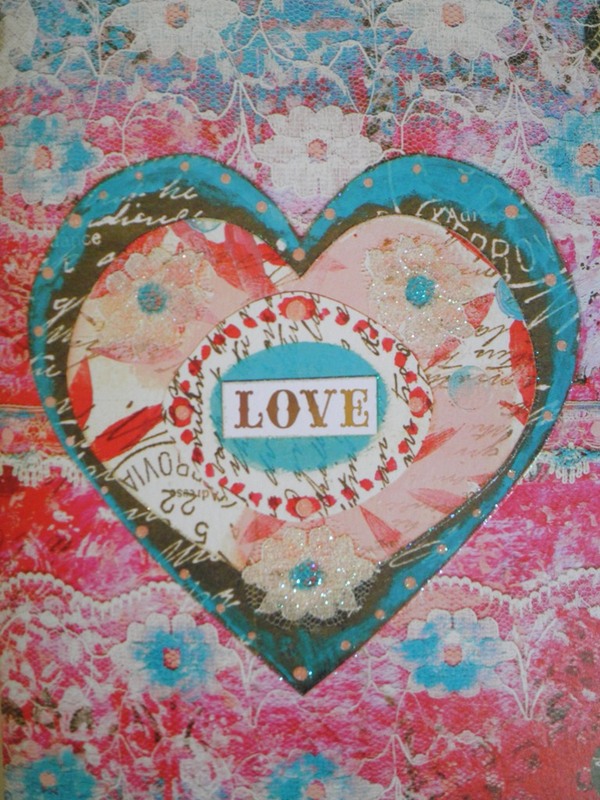 I hope your Valentines Day was special.....sending you all LOVE. This is the beginning of my Protection Cloth... I read a while back on Judy Martin's blog where she was stitching in red thread for protection, for Jack.....and at the moment I feel the need to make my own protection cloth...for my family and my friends. So much is happening and you feel you have no control over much of it. So this is my answer. I will sit and stitch a little each night, and think about those who need a mothers protection. 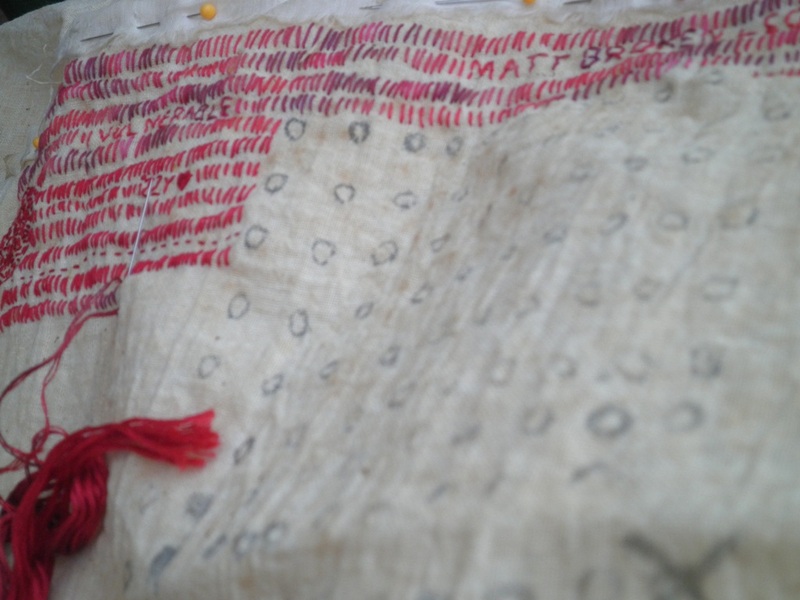 A piece of cotton cloth from Zigu Zagu, stiff in texture, with markings, circles. 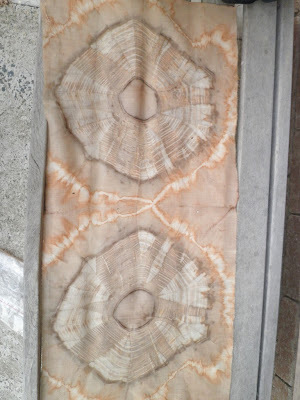 I wonder if they were for a shibori design originally as this is very old cloth. Approx. 15" wide and 2m long. It will keep my busy. The backing is a beautiful fine old silk kimono lining. 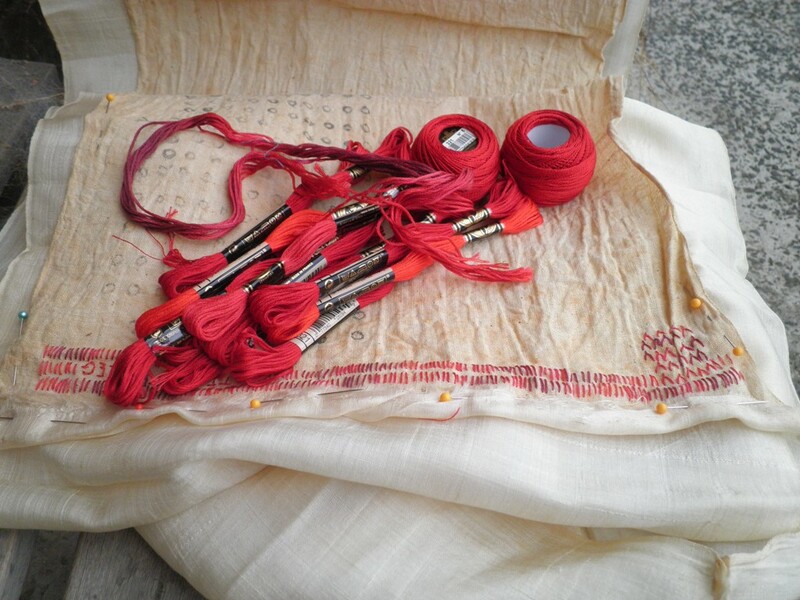 All will be stitched with a variety of red threads. Some more dyeing.... a tin can that soaked for a few days in an old onion skin bath, ready for opening and a colour catcher indigo dyed with Nat. This is a close up of the colour catcher (thank you Deanna via Nat). The resist was made by folding and clamping. I have something in mind for this....when I get a few more made. The results from the tin can dyeing (method a la Deanna and Jude Hill). I used a folded piece of very fine wool, from a deconstructed kimono from Zigu Zagu again. Close up. 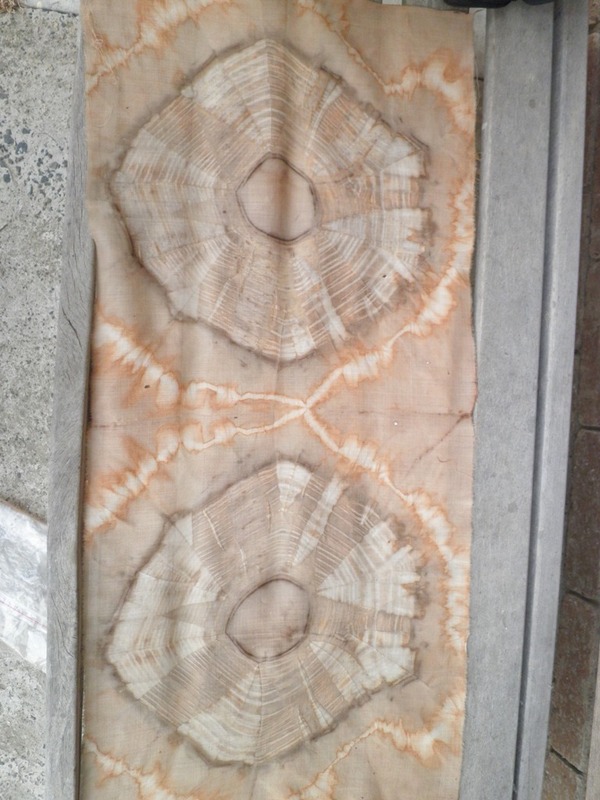 The internal rings remind me of the rings when a tree is cut down. This week is more stitching and I need to do some painting...play with those neons. I hope you have a creative week. Here it is nearly the end of January....and what have I been doing? 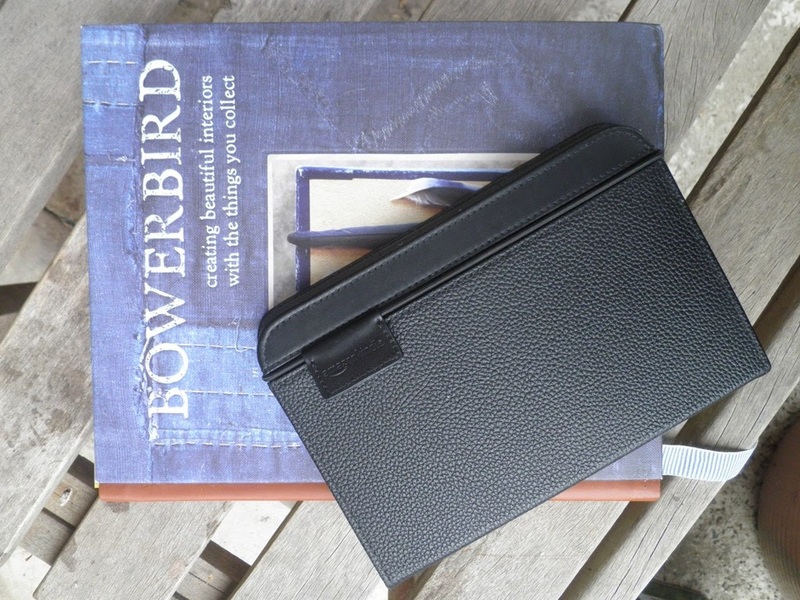 Certainly haven't been blogging! I've been doing lots of reading. Beautiful books I was given for Christmas, art books I bought last year and had time over the last month to have a good look and read of them. 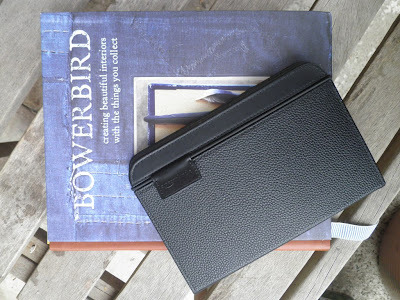 And, my e-reader has been kept very busy too. Mostly light, holiday reading. I've been dyeing with friends. 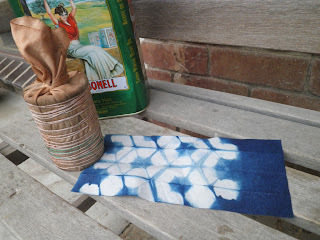 Last weekend I went to my friend Nat's and we did some indigo dyeing in her vat. Two beautiful scarves. Nat taught me how to make the fringeing to finish them off. More indigo moons, I can never have enough of these. 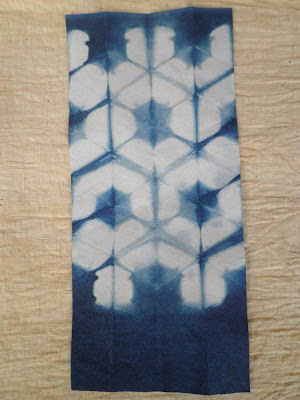 Lots of fun and our love of indigo continues. 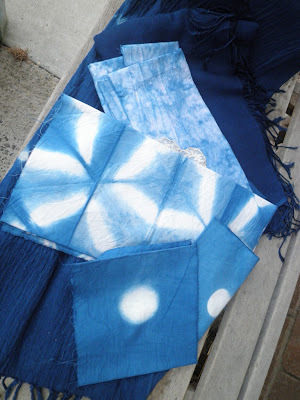 See more of our indigo dyeing adventures on Nat's blog. I picked up some lovely silks and linen samples while op. shop trawling with my friend Dot. Some of these will find their way to the dye pot soon. And I'm doing an online workshop at Tim's Sally..... I've never used neons before, but these are used in the workshop, so I thought I would be brave and give them a go. I will let you know how that went later! Tonight I plan to do some stitching....with red thread (Judy Martin says she uses red thread for protection .... I like that idea). Tomorrow is the first day of February...I will try and post more next month. There were only seven of us ..... but we had a really lovely Christmas Day. The weather was very mild, low 20's which was perfect as we like to have a traditional Christmas lunch. My sister Lee always makes a wonderful antipasta platter to start the meal....frittata, BBQ chicken balls, cheeses, olives, fruit etc. Just scrumptious. We had roast turkey with maple syrup glaze, roast lamb with garlic and rosemary, ham on the bone, and masses of beautiful vegetables. We had Chocolate meringue mousse cake, strawberry flan and much, much more. I love having the family sitting around our table for a special lunch! There's always plenty left over which keeps us going for days after the lunch. Afterwards there's always time for a bit of cricket for the boys and this year my nephew Hugh had his first driving lesson....in the farm ute out in the hay paddock. He did super and in years to come I'm sure we'll always remember his first lesson. I hope you all had a beautiful Christmas too. It's a special time of the year. And of course there were the present from family....so special, my sister Lee just knows me so well!!!! 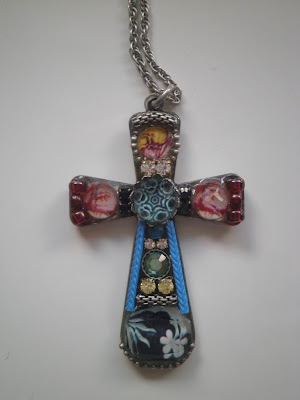 This beautiful cross pendant by Ayala Bar. 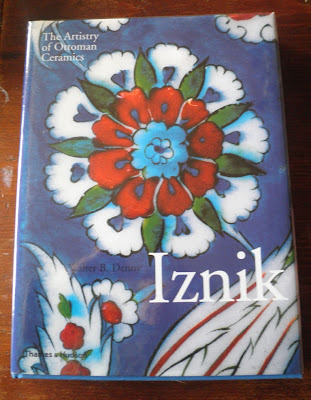 An amazing book on the ceramics of the Ottomans....this book is truly luscious (and will inspire many a painting I am sure). The colour plates are beautiful !!!! 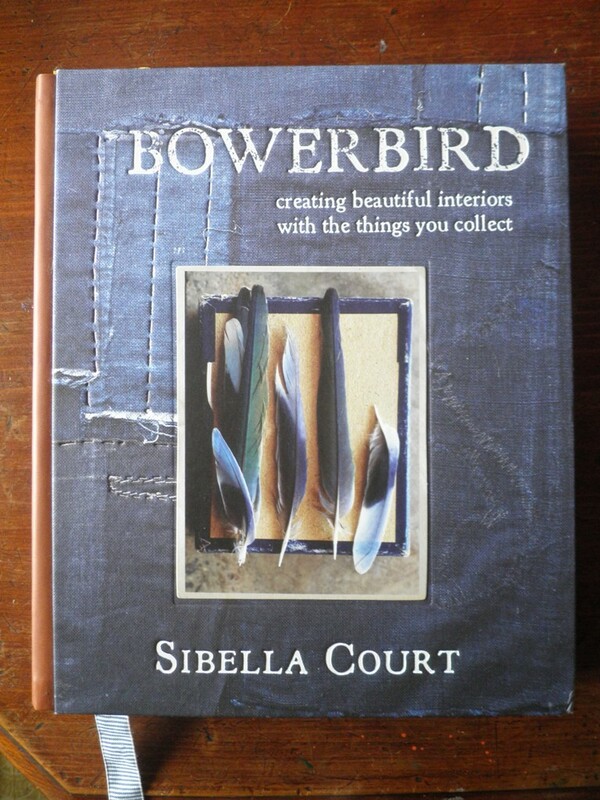 I have a bit of a reputation as a Bower Bird (and I do love blue, especially indigo, just like the bower bird). Previous books by Sibella Court are ETC. and NOMAD which are equally as lovely as this one. And what a treat this little horse was..... a Kogo (japanese incense holder) .... my heart skipped a beat when I opened this one. I had admired it at Kazari a while ago and my lovely little sister went back and bought it for me. It is only about 1.5 inches high. Such a treasure. 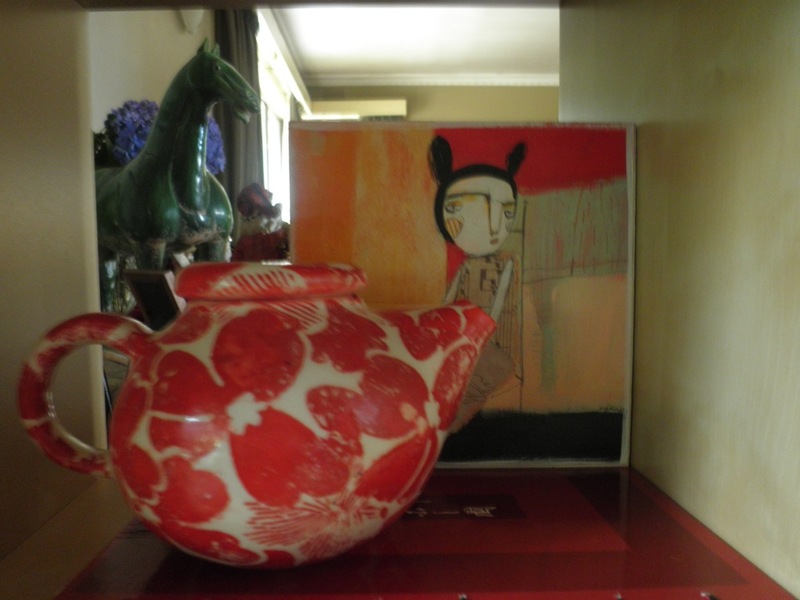 In the background is a gorgeous specimen vase I bought from Erinswindow. 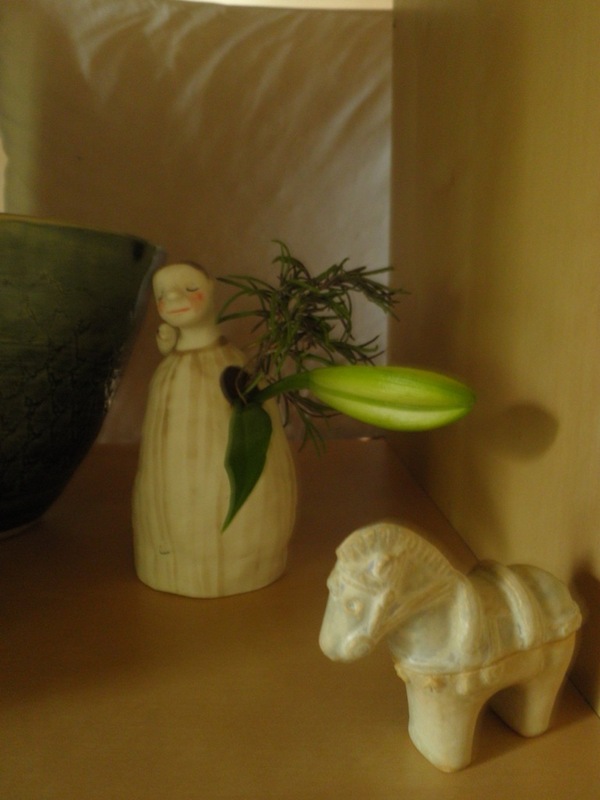 Each Sunday a light a candle for my mum and now I also place a flower in this little vase I bought for her. I bought one for Lee too so she can do the same. A beautiful pottery teapot by Samantha Robinson. I love her work and over the years have purchased quite a bit of it for Lee as she collects her pottery. The little painting behind is one that I bought from Magaly Ohika quite a while back .... another artist whose work I love and like to support. I hope your Christmas was filled with happiness and love .... just as mine was. I've been busy making clay tags again. Last weekend I visited my friend Dot and we had our very own 'clay day'. 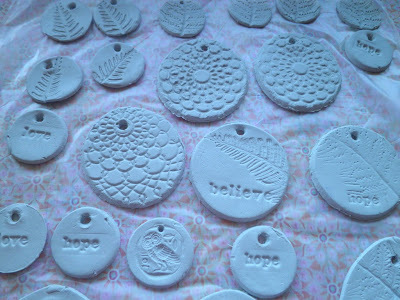 These tags are lots of fun and beautiful to decorate your gifts and/or your Christmas tree. 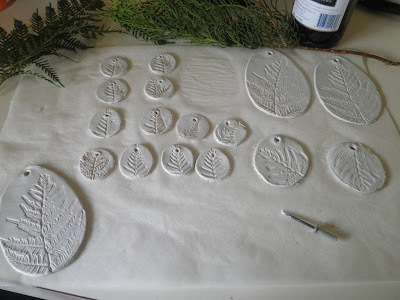 There is a great tutorial on Jo's blog ..... and many other wonderful, festive things for you to try. 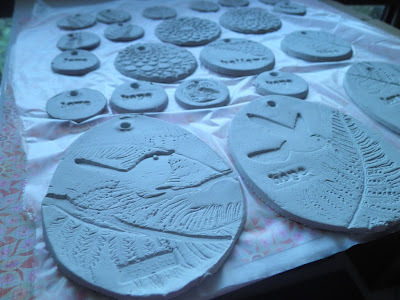 We used all kinds of things to make our imprints into the clay....my favourite being the bracken (growing along our roadside). We used a doiley, rubber stamps (the simpler the better), pieces of jewellery, cake decorating tools. I have some lovely snowflake ones that I havent photographed yet. We had lots of fun and so easy to do in your own home. 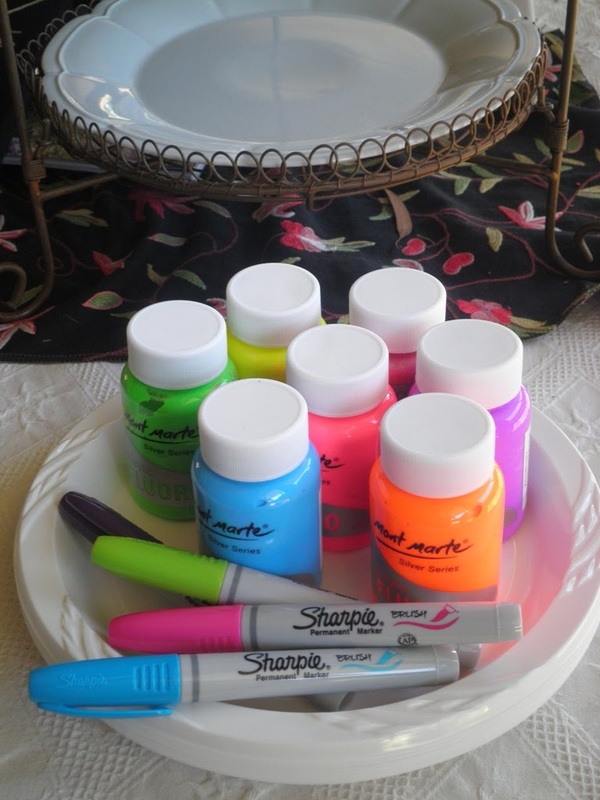 Do pop over to Jo's blog and say hi, and see the other wonderful holiday treats she has been making....I love the paper stars...already have a few of those ready for presents too. I recently did an online workshop with the lovely Roxanne of River Garden Studio. We made the most beautiful, nature inspired art books, guided gently by Roxanne. Such an enjoyable and rewarding experience. 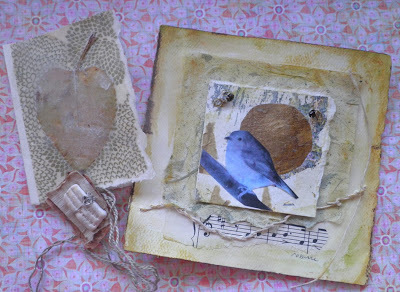 The above art by Roxanne arrived in my mail box this week.....such treasures... that beautiful little bird and the gold moon....I want to make another book now for these lovely gifts. 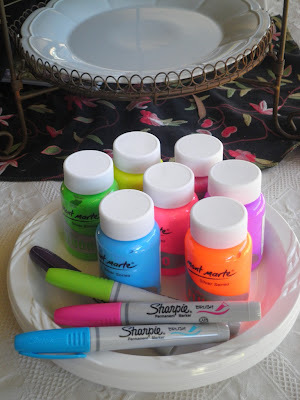 Only a short post....I just wanted to share the tutorial for the lovely tags with you all. LOVE and PEACE be with you all. I cant believe it's December already!!!! Christmas is just around the corner, and for a change I have done a lot of my Christmas shopping. I still want to make a couple of last minute gifts, but otherwise (touchwood), better organised than usual. This month, the girls I paint with on Friday mornings are having an exhibition out at Lillico Gallery. The opening was last Friday. 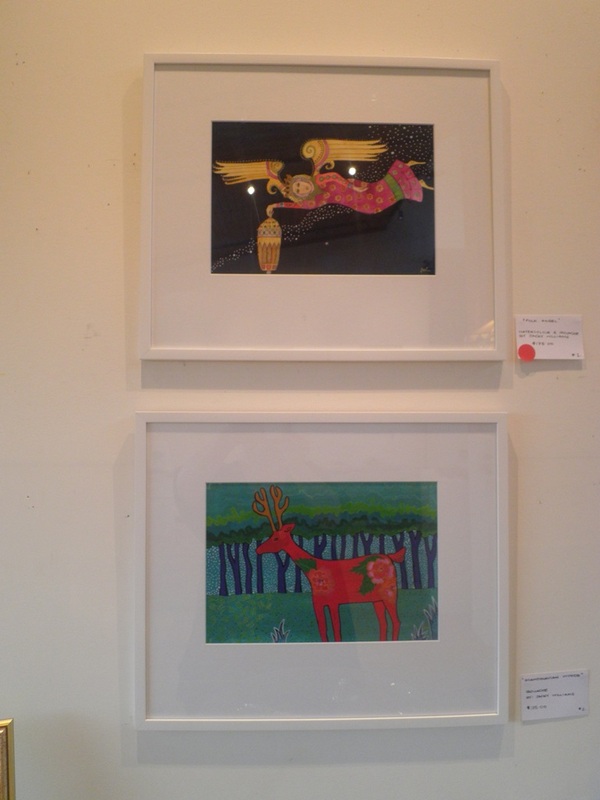 I had the two pieces below framed for the exhibition. 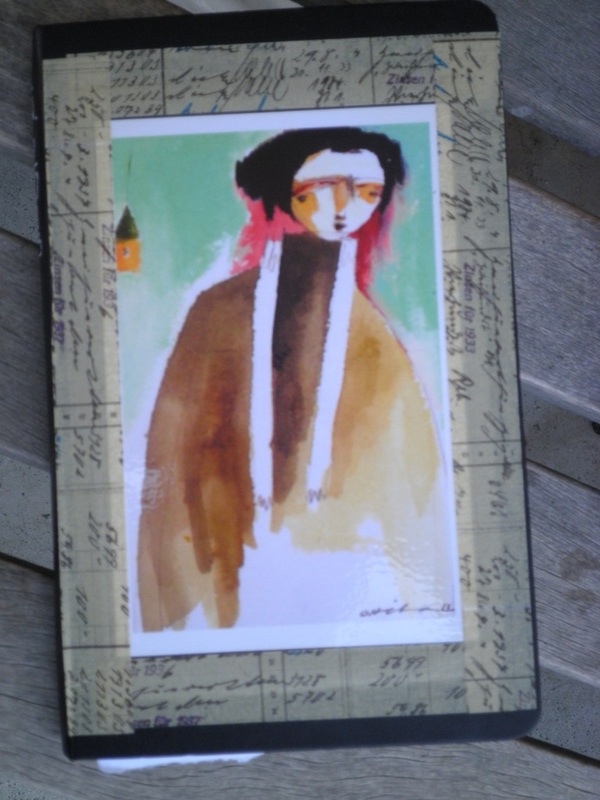 I loved the angel with the indigo sky (and she was the first piece to sell). I had painted her to use for my Christmas Cards this year. The reindeer below my angel was also painted for my cards. I really love folk, naive style artwork (and hope the people that receive my Christmas Cards do too). Click on photos for a closer look. The two white dots are the lighting, not on the painting. 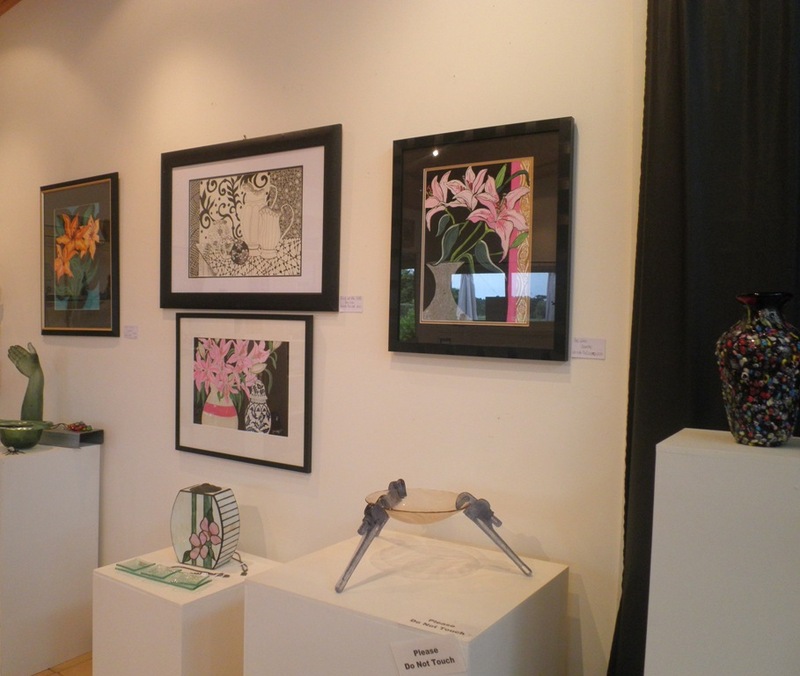 the Gallery looked wonderful with all of our art and the beautiful glassware made by the galleries owner Hayden. 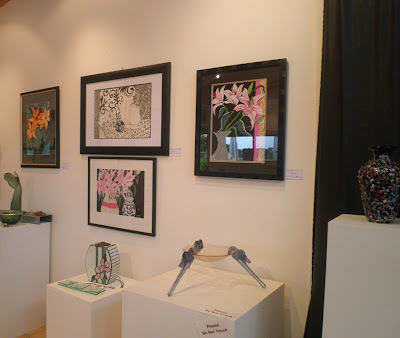 Often Meg sets up a still life for us to paint .... these were our interpretations (mine centre bottom) of a still life with pink lillies that Meg had set up when we arrived. 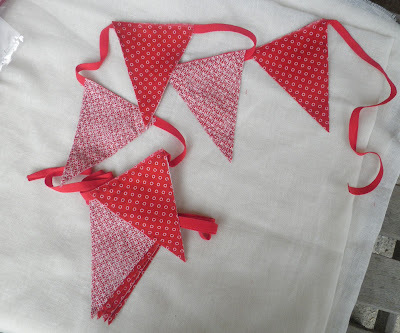 I've been busy getting some festive bunting made for friends. 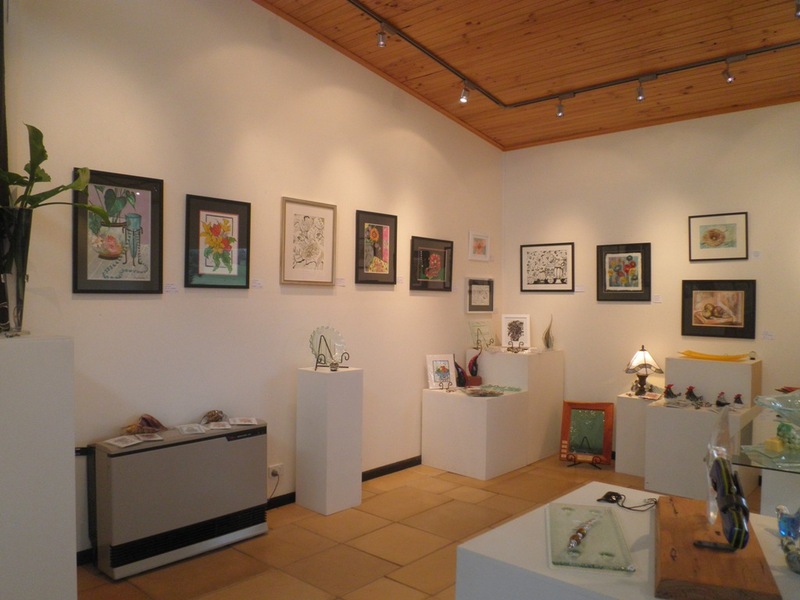 And last week went along to our local art gallery/ co-op where they were having their Wednesday "Clay Day". I really love working with the clay, molding it with your hands. This week we made these rustic clay ornaments/gift tags . I'm also taking part in a Collaborative Cloth with a few friends (Dot, Jenxo and Tallulah), over the next few months. 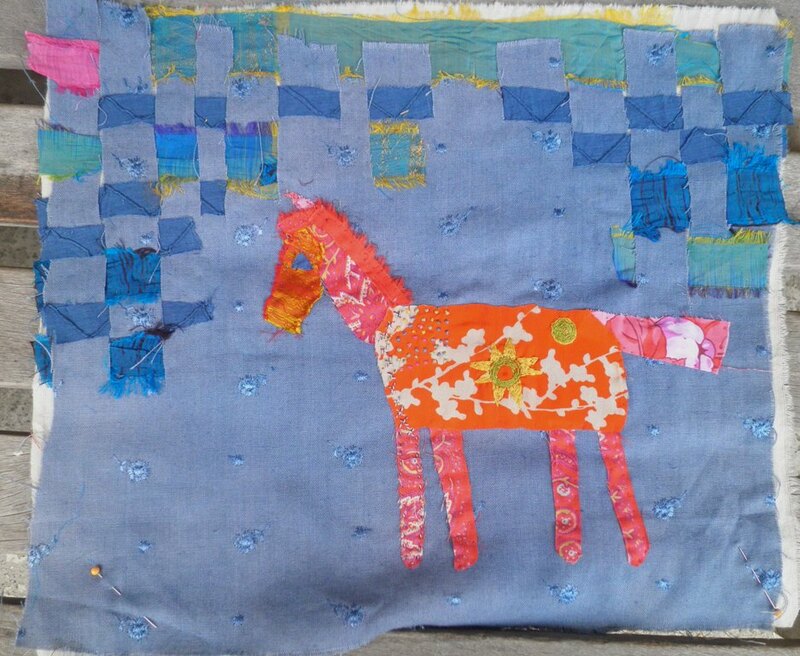 I decided my colourful pony can be sent off for the others to add their own touches. 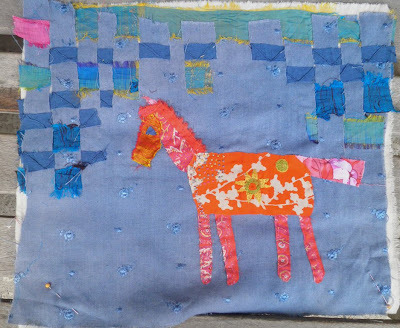 Thus far I have blind stitched the pony and stitched a couple of accents onto him and basted down the fabric weaving so others can add their stitches and/or embellishments. I look forward to seeing how he looks when he gets home again. Christmas is coming...... it always creeps up on me too quickly and I am rushing about, trying to get things finished (that I thought I had plenty of time to do!!!). But I do LOVE Christmas. Each year lately I have been doing a painting/drawing to make my own Christmas Cards. 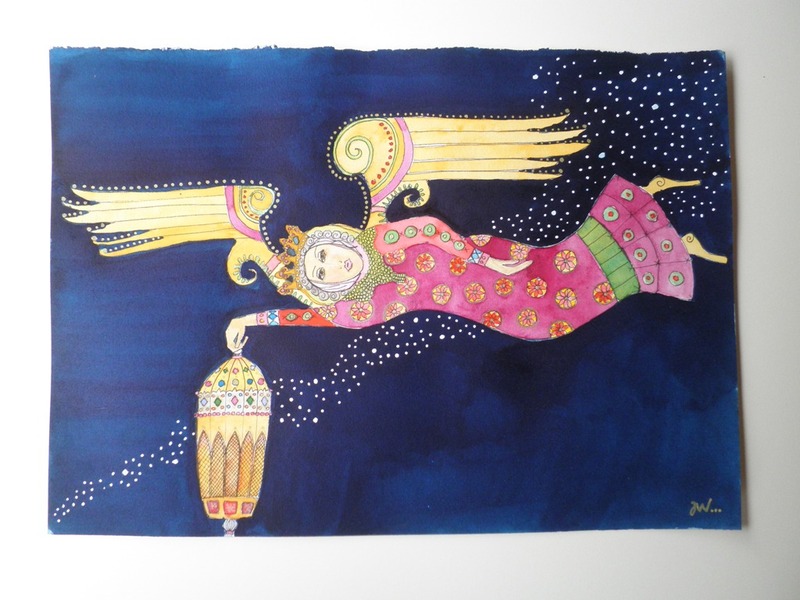 This year I did this Angel in watercolours and gouache (you can click for a closer look) .... she will grace my cards this year and I have had her framed for a Christmas exhibition my local art group are having during December. Last month I did a pastel portrait workshop with Agata Lelek.....I felt very challenged as I dont work with pastel and I am definately not a portrait painter/artist. I love naive, folk style art. I really enjoyed this workshop . We chose a picture/photo from a group that Agata supplied and then she taught us her technique of putting down the pastel with a cloth and lifting off with a kneadable eraser to make the picture appear. 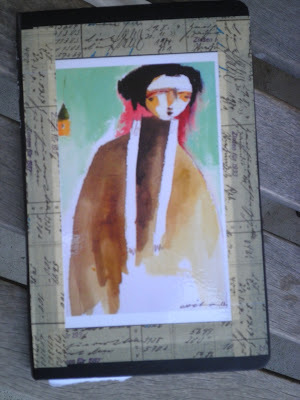 Believe it or not, the portrait below was from a picture of Charlotte Johansen in the movie "Girl with a Pearl Earring". 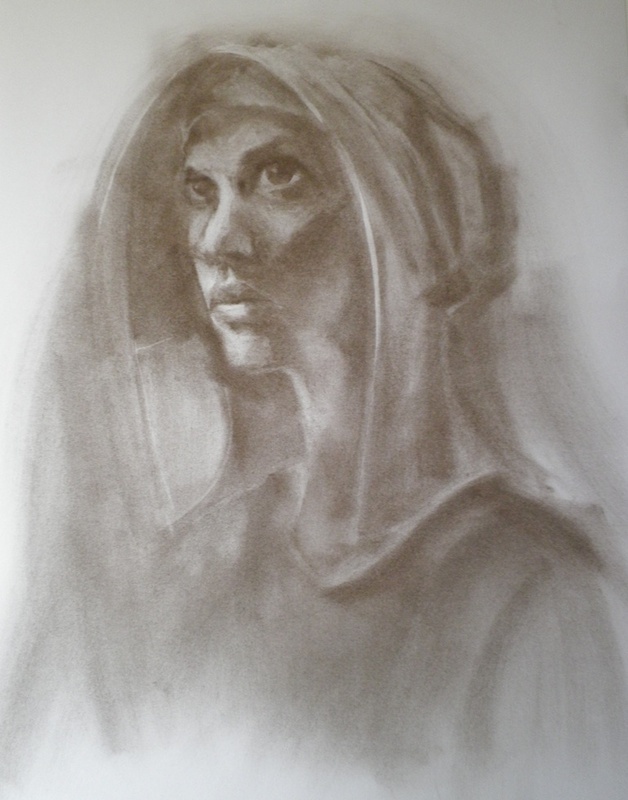 I know there's not much a resemblance, but I was pleased with my picture and would love to do more with Agata...she's a wonderful teacher. 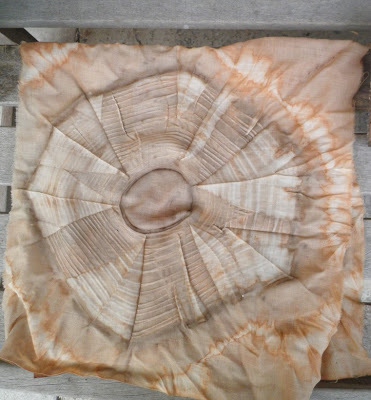 Talk about a Jack of all trades and master of none...... next..... below is a cloth I began a couple of years ago with Jude Hill. 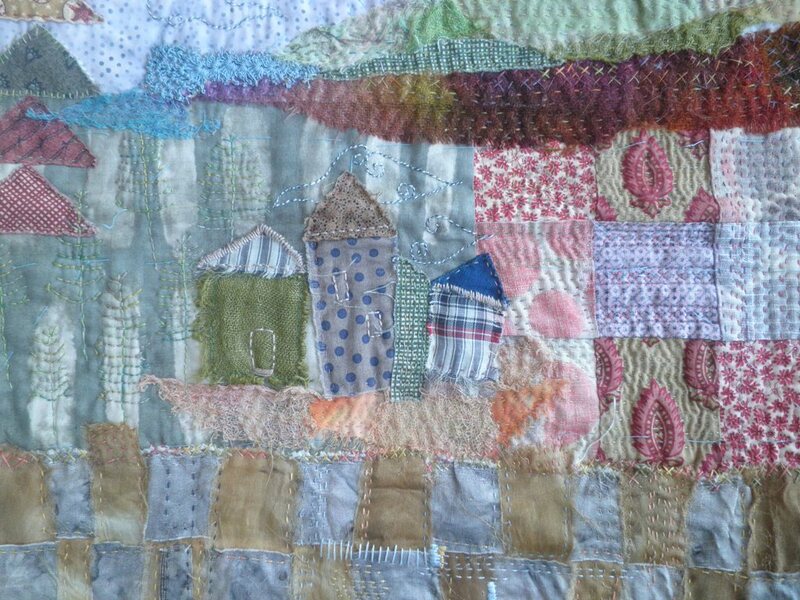 I never completed it, wasnt happy with certain elements, especially the little houses. 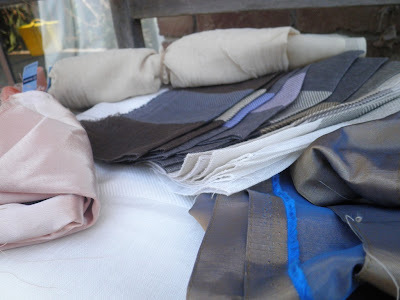 But, after seeing some of Dee's cloths, I thought I might get it out again, pin it up for a while and get some ideas brewing as to where I might go with this cloth. A page from my daily journal (which as you know I dont do daily entries....I'm not disciplined enough, but I still call it my daily journal???). I do love to record quotes I come across, words of wisdom, little anecdotes etc. from blogs I read and I love to have a play around with my little travel watercolour set. 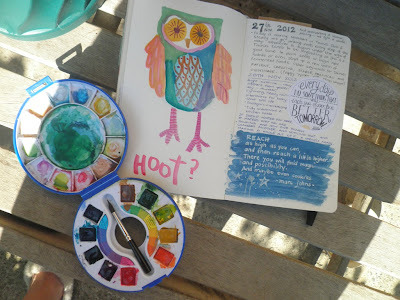 I never work on pages in a chronological order....often randomly stick something down or paint so that I come across it further into my journal...like this little owl. Elements of him were used for a linocut I did earlier this year. And now here we are in November I came across him again...that made me smile. I might even do come more work on him? 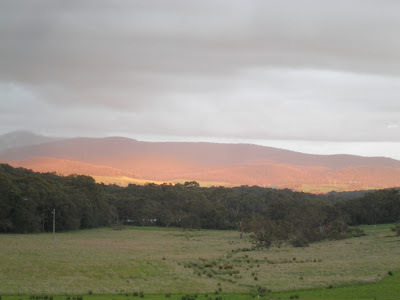 Some days when I look out my kitchen window I just have to grab my camera and capture the colours, the wedges of colour.... paddock, trees, sunlight, mountain range, sky ... this was after a storm recently and the sunlight on the land behind the trees looked amazing, was just glowing. The photo doesnt do it justice, but it reminds me of that warm glow. Take care of yourself in this weeks coming up to Christmas. Copyright 2008,2009, 2010,2011,2012. Jacquelyn Williams. All rights reserved. I am married and have two wonderful sons. 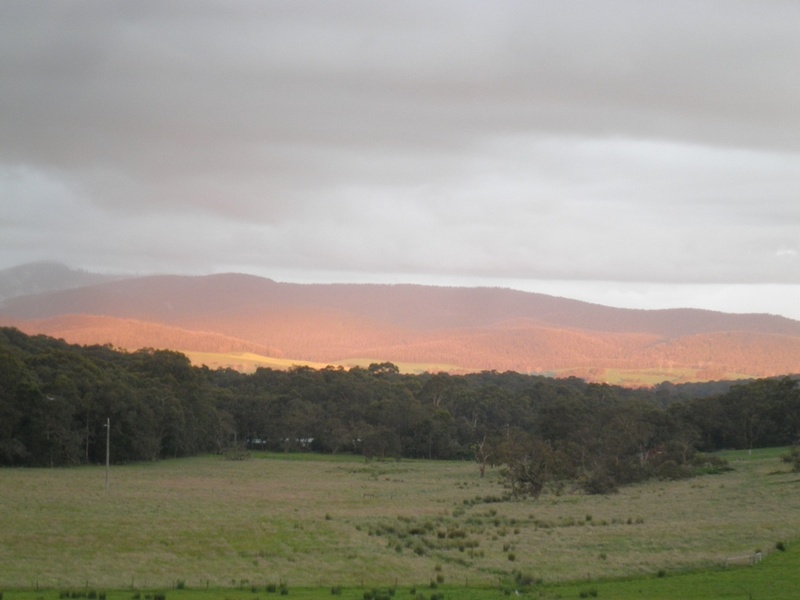 I live on a property in West Gippsland, a beautiful part of the world. 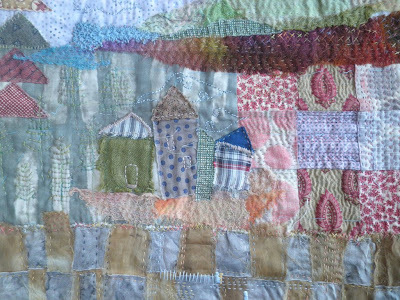 I love painting, mixed media and textiles and dabble in all of these. December views - A quiet day. i've moved, please come visit... - Time for a change. The blog has moved over to fogandswell.com/blog. Hope you'll come visit! Unmasking the Hidden.2 - Yesterday's image cropped. Construction details here. Print - Haven't been here for a while. I've been thinking about going back to painting. Sometimes I think too much! Come visit me! - I have moved to a new site. Please come visit me. 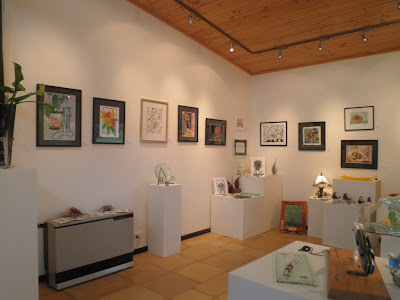 Lisa's Blog - Pursuing Art. Suze @ pink crayon studio Blog.